I spoke in Monday’s blog about how playing the seemingly trivial game of BrickBreaker taught me some key business lessons about focus. Since focus is key to success in business or in BrickBreaker, here are some more lessons learned. Focus forward, focus tight, focus smart. Avoid the temptation to multi-task. Sometimes in BrickBreaker you’ll hit a brick which releases a capsule containing multiple balls. Instead of there being a single ball for me to keep my eye on, all of a sudden there are four balls flying around, each of which is tempting me to pay attention to it. Ninety percent of the time I find that, if I try to handle several balls at once, I end up not handling any of them at all, losing a turn, and stopping the progress of the game dead in its tracks. It’s a good reminder to focus on one task, one activity that will produce the greatest business results for me, and only then switch to another task. So there you have it: the last of two weeks’ worth of business lessons I learned from playing BrickBreaker. What do you think of all this? Have you learned these lessons through some other powerful teacher? What’s been the result of applying them in your business? By the way, thank you to Tools for providing the dictionary image in the Creative Commons section of Flickr. 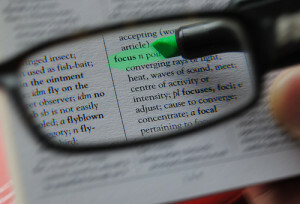 This entry was posted in focus, productivity, results, success factors and tagged choice, focus, goals, productivity. Bookmark the permalink.